Today, I’m excited to complete my three part series highlighting my recent online marketing presentation at Stanford Graduate School of Business. I first recommend checking out part one and part two of this series. In this six video series, I provide a multitude of online marketing quick win tips. These are tips that will help anyone drive affordable, effective traffic to their online business. Today, I’m excited to close out the series with two videos featuring social media, email, and outsourcing tips. I cover a lot of social media topics in online marketing video five. Specifically, I cover TweetAdder, overall Twitter strategies, YouTube strategies, RSS feeds (and FeedBurner in particular). Also, I discuss lead capture via email marketing and in particular the AWeber platform. Video six closes out with more AWeber email marketing tips and outsourcing tips. I’m really excited to discuss one of my favorite writers on Elance (one of the golden nuggets of my presentation) and also how to leverage Fiverr, a new $5 outsourcing platform, for video testimonials among other projects. I have literally been addicted to Fiverr lately and have been getting a lot of great, affordable, and time-efficient results from this innovative platform. 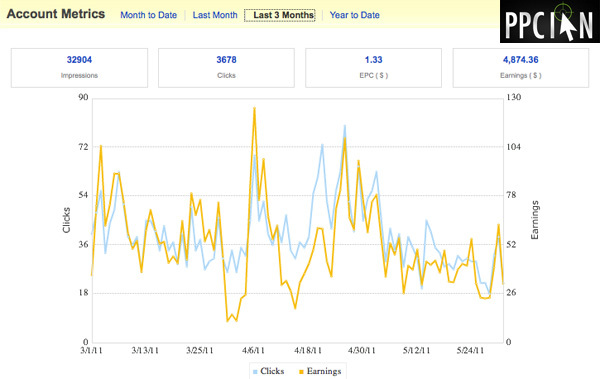 Thanks again for watching my online marketing videos! 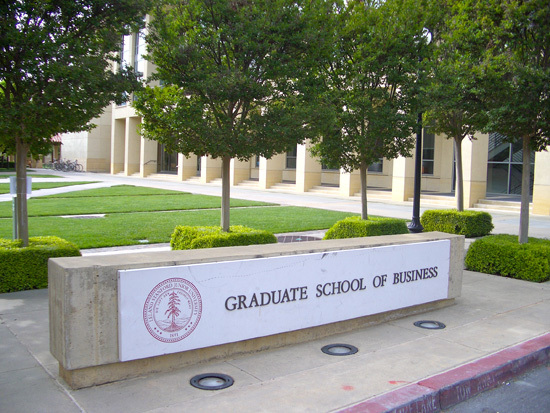 I just presented online marketing quick win tips and strategies at Stanford Graduate School of Business. My presentation went really well and I’m thrilled to have the entire thing on HD video. In my last post (I highly recommend checking it out before this one), I shared my first two videos (out of six). Those videos focused mainly on PPC and Facebook advertising tips. Today, I’m pleased to share videos three and four! In just a few short days, I’ll share the final two. What’s included in today’s online marketing videos? Some really cool stuff: SEO link building, SEO tips and strategies, social media marketing opportunities, and more. Thanks for watching and a big thank you to Stanford Graduate School of business for hosting me! In online marketing video three I cover some exciting link building topics. As you may know, link building is of paramount importance when ranking your website or blog on head terms. Specifically I do a deep dive into my ever popular blog commentating strategy. 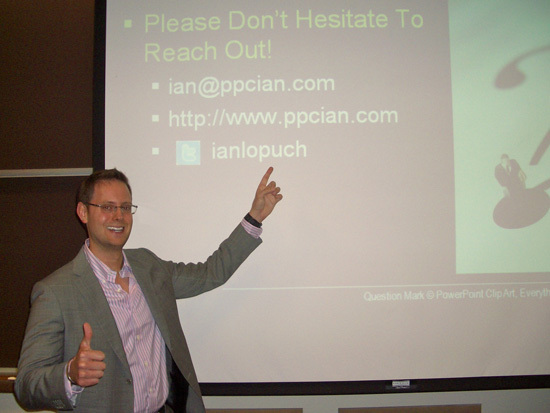 If you’ve been reading PPC Ian for a while, you may know I’m a huge fan of blog commenting and even ran a blog commentating contest that was really successful (I’m thinking of doing another one in 2011). 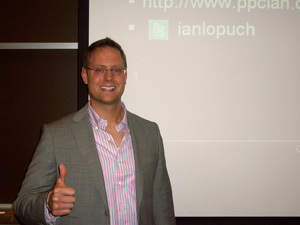 I also cover other SEO link building topics including guest interviews and SEO-optimized press releases through PRWeb. In video four, I cover both SEO and social media topics. I start out with more information about SEO-optimized press releases from PRWeb and then link building strategies via social profiles. The social profile strategy can actually backfire if you don’t have a long term, conservative perspective so I discuss how to do it right. Next, I transition into the SEO benefits of the Epik product portal platform, and close out with some social media tips including Facebook Fan Page optimization and gaining Twitter followers with TweetAdder. Thanks again for watching and I hope you enjoy these online marketing quick win tips! 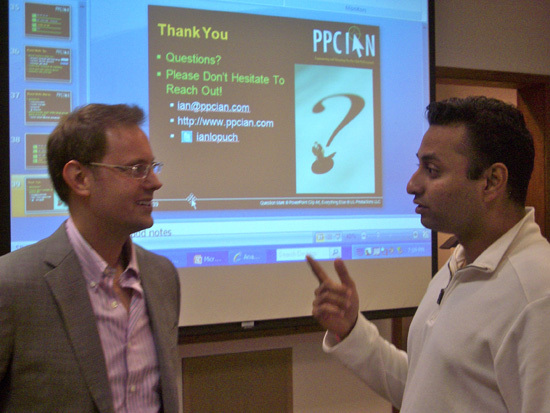 Back in May of 2010, I presented a two hour introduction to online marketing at Stanford Graduate School of Business. The presentation went incredibly well and was a true honor and milestone in my career. I graduated Stanford with my BS in Computer Science so it was really exciting to go back and present at Stanford GSB. Today, I’ve got some really exciting news: I just went back and presented again this Wednesday! That’s right, I got invited back in less than a year so I’m definitely on the right track. I’m very passionate about Stanford, online marketing, and public speaking so I’m truly excited about this accomplishment. Even better news: I have six HD videos of my new presentation that I’m excited to share with you. The first two videos are featured in this post, and then I will include the final four within the next few days. I was fortunate yet again to have an amazing audience of around 35 or so genius GSB students from the entrepreneur, high tech, and marketing clubs, students who asked some really great questions! My sincere thank you to everyone from these great clubs and everyone at GSB who attended and hosted me, especially Courtney from Wokai. I have two exciting HD videos to share with you today. The first video covers quick wins on Google AdWords and Facebook. When it comes to Google AdWords, there are few marketers out there who have been directly responsible for as much spend as myself. This is really where it all started for me and how I became a guru in the online marketing industry. I’m newer to Facebook advertising but am quickly learning. I have been promoting my Facebook Fan Page quite a bit lately and discuss some tips for gaining more likes! The second video covers more Facebook advertising tips, the Yahoo/Microsoft Search Alliance, keyword generation (via broad match), and blogging. I really hope you enjoy these videos and can’t wait to share the next four. Thanks so much for watching. 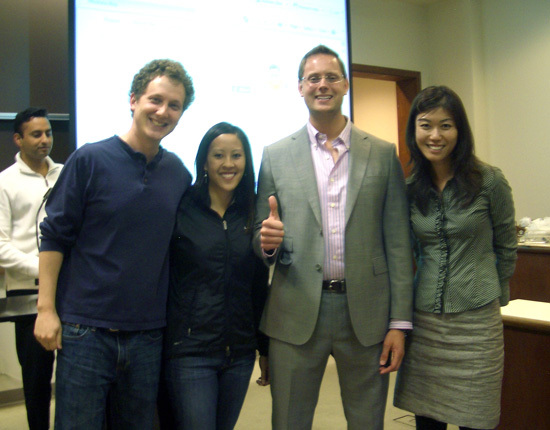 Below you can see yours truly with some of the students from Stanford Graduate School of Business. I actually spoke to about 35 or so students. We took this picture after the presentation with some of the students who stayed after to ask questions. I sincerely appreciate the great turn out and all the support from Stanford GSB’s entrepreneur, high tech, and marketing clubs! Also, I want to especially thank Courtney (next to me in picture) for organizing this event! 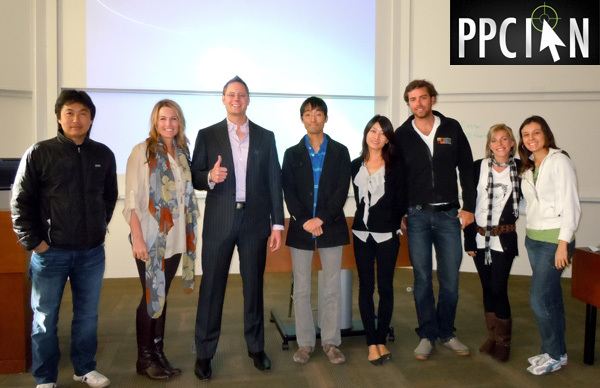 In my last post, I highlighted my presentation at Stanford’s Graduate School of Business. 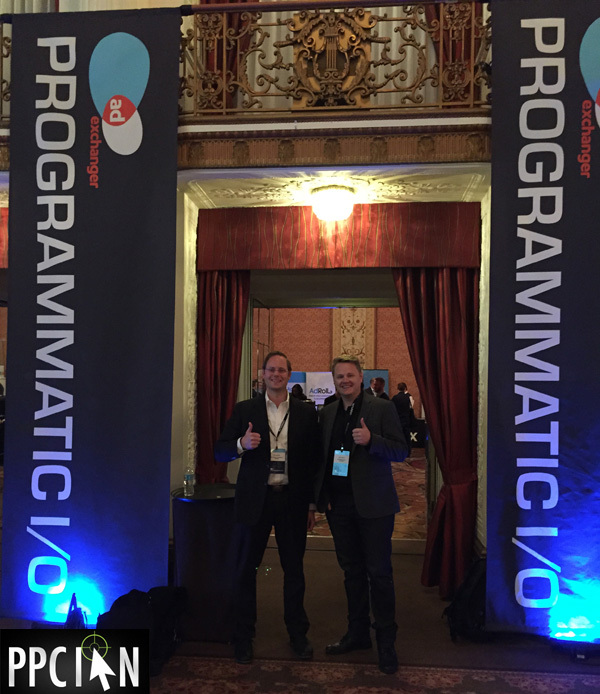 The presentation went extremely well and spanned two action-packed hours of PPC, SEO, and more. I’m definitely proud of this milestone. Today my friend David Rogier, VP of Stanford GSB’s Entrepreneur Club, uploaded the video of my presentation to the Entrepreneur Club’s website! You can check out my online marketing presentation by visiting the Entrepreneur Club’s website or by simply watching it below! I sincerely hope you find it helpful. Also, I wanted to close out by sincerely thanking Stanford GSB, the amazing organizers of the event, everyone who attended, and of course everyone reading my blog! PS – As mentioned in my last post, my PowerPoint presentation is available for free! Simply sign up for my free PPC newsletter by entering your first name and email address in the top right corner of this page or by visiting my PPC newsletter page. You’ll receive my Stanford GSB presentation in addition to my eBook featuring high leverage PPC career tips, all for free! I recommend following along with the PowerPoint as you watch the video. Don’t have enough time to watch the full two hour video? You may wish to scan the PowerPoint and then fast forward to the sections of the video that are most interesting to you! Thanks again! 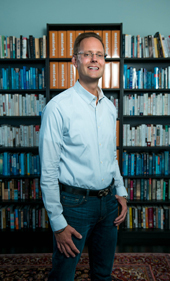 David Rogier – VP of the Entrepreneur Club and Resident at the Center for Entrepreneurial Studies. David organized my event and I can’t thank him enough! I short, the folks mentioned above are none other than amazing. I was blown away by Stanford GSB’s leadership team. I’m very excited to have some new friends. As you may know, I graduated from Stanford back in 2004 with my BS in Computer Science and Minor in Economics. In my opinion, Stanford is the best university out there! When VP of Stanford GSB’s Entrepreneur Club David Rogier invited me to speak at Stanford, I just couldn’t pass up the amazing opportunity. As you may know, I’m really big on goals and a big public speaking event is on my list of 2010 goals. I’m extremely excited that this event allowed me to complete my goal (and then some!). Over the past few weeks, I have been working very diligently on my presentation, one that provides actionable tips to optimize PPC and SEO online marketing campaigns. All of the students in the audience have businesses they are trying to launch. I hope that my PPC and SEO strategies help launch their dreams! During my presentation, I was very thrilled to see an engaged audience for two full hours. How awesome is that! It really was amazing how fast time flew by. Moreover, I was floored with the awesome questions that the attendees asked. This level of interaction really made my presentation fun. It’s hard to find a sharper audience than Stanford GSB students, in my opinion. 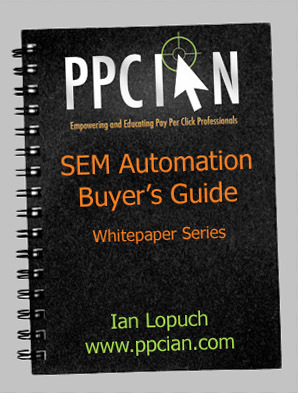 For all PPC Ian readers out there, I want to make my PowerPoint presentation available for your viewing! As such, (in addition to my free eBook) my Stanford GSB PowerPoint is now free when you sign up for my newsletter! All you have to do is enter your first name and email in the box in the upper right corner of this page (or on my PPC eBook page). Already on my newsletter list? I will be sending you my presentation very shortly. Thanks again everyone, you are the best! PS – Big thank you to my beautiful wife, Nicole, for designing my PowerPoint template and for making it look amazing! PPS – The video of my presentation is now uploaded! 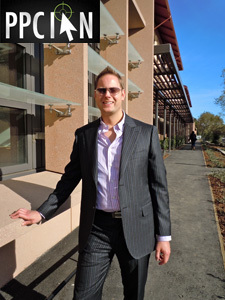 Check out my Stanford GSB online marketing presentation video!